In order to know if your child is timid it is necessary to know how to tell the difference between having an introverted personality and having a hard time socializing. Introverted children are referred to as children who are immersed in their own thinking or emotions, children who enjoy being alone and consciously choose to be, but not because of insecurities or lack of social ability. This behavior can be normal in certain stages of infancy. A timid child, on the other hand, feels uncomfortable in social situations and above all feels insecure when their parents are not around. 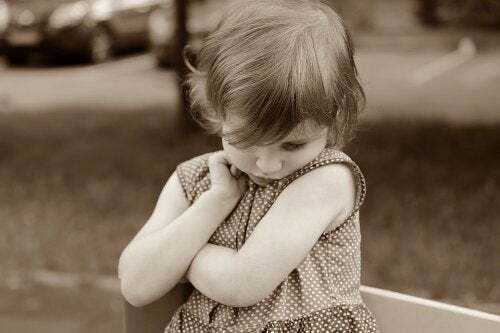 There are two driving factors behind timid personalities, one of them is that one of the parents of the child is timid and hence the child learns by imitating their parent’s behavior. The second is having parents that could be very social but at the same time overprotective. Both of these driving factors, according to recent theories in psychology, are the leading causes in creating a timid child. The ideal solution is to help the child develop other areas of their life and learn to express themselves in their own way. The development of these children should be pressure free and parents should avoid being overprotective, which as we know is one of the causes of timidity. Society has sold to us a prototype that extroverted people are successful while the timid ones, even if they are talented, should work on themselves in order to interact more with the world. However, being introverted is not necessarily negative. There are many examples to prove it, for example Albert Einstein, Jk Rowling and Dr.Seuss to mention a few. Although they did not demonstrate a lot of social skills they stood out in other aspects, such as innovation, creativity and sensitivity and their work no doubt changed the world. Introverted people enjoy silence. They are analytical, prudent and very centered in things that they like. This is why they prefer tranquil spaces. Being alone allows them to concentrate. It is the complete opposite of extroverts who tend to think out loud and love to be in social settings. As we can see, there are both two different personalities and both are very different from being timid. We can think of timidity when a child stops progressing in some sort of activity because of a fear of social interaction. When they cry a lot in situations that do no necessarily merit it and when they regularly isolate themselves – these are all symptoms of social anxiety which should be evaluated by a specialist. There are also cases in which children manifest social phobia in an attenuated and persistent way from a very early age. This is a situation in which psychotherapy may be applied and above all fundamental support from school is necessary. According to a report published by Canadian magazine Today’s Parent, which specializes in family and children’s health. Parents, sometimes inadvertently contribute to their children’s shyness. It is also important for parents to know that one of the main causes of a child being timid is overprotection. Overprotecting your children can cause issues such as insecurity and low self-esteem which are factors that can make a child timid. A recent study published by The New York Times based on surveys carried out by more that 100,000 students from the University of Pennsylvania confirms that anxiety is a very common health problem faced by students. The study also found that 1 out of 6 students suffer from depression, stress or anxiety. The report also backs up that one of the main reasons behind these problems was the overprotection of their parents.